The prevalence of computer connectivity has instituted a new state of being -- online. Architecturally, this new state has been complicated by its ambiguity of spatial referents. 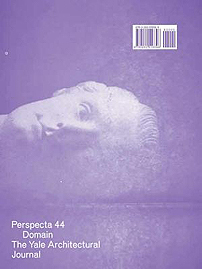 Thus, for two decades now, the theoretical challenge has been to articulate the relation between the spatialities of the physical and the connected, the online, the virtual.1 Because architecture is concerned with the order of space, any characteristic pertaining to this emerging spatial paradigm will unavoidably affect architecture itself: one such notion is the omnipresent avatar. In the following argument, it is further proposed that understanding the virtual might mean a disassociation from the idea of virtual space, and the nomination of the avatar as a key spatial metric to virtuality. Attention to this type of epistemology of paradox, or irony, is the most constructive way to theorize postmodernism in architecture. It is not useful to rehearse what has now turned into an historiographic cliché, according to which postmodern architecture is seen as synonymous with a certain type of a parochial aesthetics assembled from an uncritical pillage of history—which is, in turn, effortlessly and uncritically assimilated by the market. 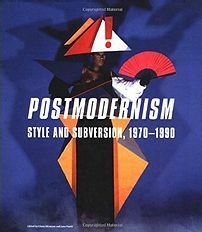 What might be the case of the more stylistically defined PoMo (largely attributable to the influence of Philip Johnson, on the one hand, and to Charles Jencks’s prolific campaigning for postmodernism, on the other) is not simply transferrable to all of postmodern architecture. No question has been more stimulating to Tigerman than the relationship (and disjunction) between “thinking” in architecture and its socio-physical reality. To him, this double reality is deeply engrained in the cultural self-identification of the diverse ethnicity of the West. Fueled by his interest in the distinct social traditions of various religious and cultural groups, especially Hebrew culture, Tigerman discovered a cleft between two versions of the original hut: on the one hand, the ancient Greeks had inaugurated the hegemonic paradigm of the physically present, geometrically defined temple, built for eternity—the Parthenon claiming its right to exist against nature. On the other hand, Tigerman refers to the First Temple of the Jews: unlike the Parthenon, whose heavy stones prevail as a verifiable Classical source, the vanished Temple of Solomon can only be recalled through labyrinths of archeological and ethnological memory. Whereas the Hellenic temple is actual, the Hebrew edifice is present as absence—it only exists as a multiplicity of narrations and exegeses. It associates more with a temporary tent or scaffolding than a solid building. Tigerman maintains that neither of these temples could exist in a “pure” state or in isolation, as an autonomous aesthetic "thing." Indeed, if one took seriously the ethical grounds of architecture as Tigerman does, each one of these conceptual models would have to acknowledge the existence of the other, and jettison a longing for a stabilizing (Hegelian) synthesis between them. With the intellectual resources of ethical and dialogical philosophers, from Søren Kierkegaard to Martin Buber and Emmanuel Levinas, Tigerman sees dynamic dialectic as the source of architecture’s contamination and, at the same time, of its vitality. In his architectural oeuvre, the dialectic has manifested itself in different ways and in diverse media—from the titles of his 1982 and 1988 books, respectively Versus and Architecture of Exile, to the binary compositions of sketches and design objects—and to the polar organization of many of his architectural projects such as the Little House in the Clouds (1976), the Daisy House in Porter, Indiana (1976–78), the Urban Villa in Tegeler Hafen (1984–88), the D.O.M. Corporate Headquarters in Cologne, Germany (1980), and the Berlin Wall Project (2000). The most polemical expression of the idea of dialectics in architecture is Tigerman’s now famous 1978 collage, “The Titanic,” where he floats Mies van der Rohe’s Crown Hall at the Illinois Institute of Technology precariously in Lake Michigan against a background of clouds, acting as symbol of a necessary supplement to all creative and humane architecture: arationality and ambivalence. To Tigerman, Mies was the modern heir of the Greek ideology of hierarchy and “presence,” which Mies inherited from Karl F. Schinkel. 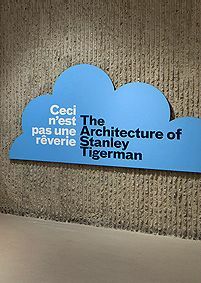 Tigerman’s collage suggested that Mies’s rigid geometry should be seen against its “other”— the fluid and indeterminate formal logic of waves and clouds. Unlike the Parthenon, which was conceived as a crowning event, erected in stark contrast to the natural landscape, Mies’s “temple of architecture,” reinterpreted as “The Titanic,” appeared in egalitarian dialogue with the ephemerality of nature. 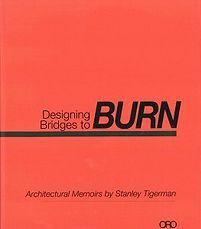 No document of Stanley Tigerman can represent his persona and his views on architecture more authentically than an autobiography, inasmuch as the architecture of this sort of text is constructed from the vantage point of the first-person narrative. Without a doubt, one of Tigerman’s most idiosyncratic and cardinal contributions to the architectural discussion has been his relentless insistence on the centrality of the ethical character of the architect in interpreting his or her physical, cultural and sociological habitat; as such, every single one of Tigerman’s utterances bears the traces of the author’s individuality, and is, in a way, to be seen as a transcript of his personal life story. He has unconsciously aligned himself with the humorous and satirical novelist Evelyn Waugh’s claim that autobiography “is not the most important subject in history but it is one about which you are uniquely qualified to speak.” This being the case, the autobiography allows the reader to partially circumvent the official libretto of “Tigerman” in order to also glimpse into the more picaresque scrapbook of “Stanley”; without this insight into Stanley’s weltanschauung, the architectural thematic of Tigerman will remain inscrutable. Stanley has also used an invented name, the pen name “Morris Lesser,” but unlike Mies and Jeanneret, he did it with much the same intentions with which Søren Kierkegaard, the father of existentialism, alternatively wrote as the pseudonymous characters Victor Eremita, Johannes de Silentio, Johannes the Seducer and Anti-Climacus, among others; for Stanley, the story of architecture was fundamentally multifarious, polyphonous and non-reducible to grand, “catholic” styles and tenets. And so, just like Kierkegaard made of the idealist Systemdenker G.W.F. Hegel his intellectual other, Stanley saw in the German emigré Mies van der Rohe his Oedipal (modern) alter ego. More voodoo doll than straw figure, however, Tigerman’s version of Mies was contrived to release Stanley from a spell, which he felt was cast on his generation of Chicago architects by the rigid universals and the zeitgeist ethic of (post-“Hellenic”) modernism. This father figure could not be killed, but had been set adrift in the endless ocean of the architectural subconscious of Stanley’s generation of (post)-modern Chicago architects: The Titanic, alias Mies, could not simply sink, but instead had to stay suspended on the ocean surface as the paragon of a modern belief system, whose framework has irretrievably been corroded. Anglo-American poet W.H. Auden once alleged that “every autobiography is concerned with two characters, a Don Quixote, the Ego, and a Sancho Panza, the Self.” Stanley Tigerman truly embodies Auden’s incongruous and complementary double character--which is not only symptomatic of postmodernism’s complicated relationship towards the past (and modernism in particular), but is also suggestive of the essential divide inhabiting the “ethical” person, i.e. the gap between the aesthetic and ethical stages of existence, which Kierkegaard had marked out in his dual tome Either/Or. Is not the myth of architecture’s “knight of purity,” Mies van der Rohe, Tigerman’s autobiographical Don Quixotte, and “Stanley” his Sancho Panza?--One can discern, in Tigerman, Cervantes’s dyad mentalities: On the one hand, Tigerman inherited from both Mies and from Paul Rudolph the architectural instinct to join the “great adventure” of a modern formal language (and become, in Rem Koolhaas’s terminology, “a voluntary prisoner” of the discipline); yet on the other hand, one observes Stanley’s relentless itch to overturn Mies’s delusional enchantment with a particular brand of skepticism, alternatively boosted by the satirical comedy of Charlie Chaplin, the surrealist wit of René Magritte, the jaunty irony of Claes Oldenburg or the libidinal analyses of Sigmund Freud, among others. The Janus-faced divide put forward by Auden does never go away with Tigerman, but paradoxically constitutes the connective motif throughout his work--from his writing and his painting, to his travel sketches and cartoons (Architoons), to his furniture, jewelry and tableware designs, and to his projects on the architectural and urban scales.